Dating is expensive, especially when expectations are high! But regardless of your budget, you can plan an extraordinary first date that’s both impressive and affordable, just by applying the right discounts and credit card perks. We’ve identified the best ways to save on 4 popular dates, so you can focus on your romantic evening rather than how far you’re spending over-budget. Maybe you’re meeting for the first time, and you’re not quite ready for a long, extravagant date. A casual afternoon over coffee is a popular way to lead with conversation and get to know each other (plus, it’s already a cost-conscious option). To save even more, first check your credit card perks. Maybank and American Express cards are especially likely to offer discounts and promotions on coffee and at cafés. This is a great option if you’re not sure where to go, because coffee promotions are often limited to specific merchants. You can enjoy a sit-down coffee experience for hawker-center prices, with frequent offers of S$1 drinks and pastries, or even complimentary items. The best part is that Maybank cards are often quite affordable, with low minimum spend requirements and waivers for their annual fees. If you already have a specific café in mind, you can still save on your purchases. HSBC Visa Platinum Card offers 5% cashback at any café, and Citi SMRT Card and OCBC Frank Card offer rebates with select merchants (The Coffee Bean & Tea Leaf, Starbucks, The Connoisseur Concerto and more). The best part is that merchants like The Coffee Bean & Tea Leaf and Starbucks offer their own promotions and loyalty programmes. If you’ve earned a loyalty reward, you can apply it for a store discount and still earn cashback on the total bill. However, you can also benefit from a credit card that simply has a high rewards rate for dining, like CIMB Visa Signature. Ok, so let’s say you want the most casual of dates–grabbing kopi (about S$1 each) and just strolling the neighborhood. Well, while most hawker centres currently don’t accept credit cards, they’ll be accepting cashless payments by 2020. So no matter where you go, your coffee date can actually let you keep a bit of money in your pocket. Lucky for you, many credit cards offer deals on movies and restaurants–as well as cashback on dining and entertainment. Pairing these perks makes the classic ‘dinner and a movie date’ one of the most rewarding options out there. For one example, UOB YOLO Card offers a 2% rebate at Cathay Cineplexes, plus 8% rebate on weekend entertainment spend. This adds up to an impressive 10% cashback on your movie experience. Even more, you’ll also enjoy 1-for-1 food and drink specials, with an added 8% rebate for weekend dining. Overall, you can save an incredible amount without compromising on the quality of your date. Other cards that come with cashback and deals for dining and entertainment include Citi SMRT Card and HSBC Revolution Card. However, if you don’t have these credit cards and aren’t interested in opening a new one just for your date (understandable), you can access discounts in different ways. First, try checking cinema webpages to see if there are any current offers. Then, check out ChopeDeals or HungryDeals for 1-for-1 promotions and discounts offered by restaurants themselves. You can also often find discounted gift cards for theaters and restaurants on marketplace sites like Carousell. These are all respectable options, but they’re also ‘stand-alone’–you won’t be able to combine credit card benefits with these deals. Maybe you’ve actually been dating for a while and just want a lazy night in–yes, this definitely counts as a date night too! You might be surprised, but you can save on this low key get-together as well. If you’ve never signed up for Netflix before, now might be a good time to try. You can enjoy a 30-Day free trial through Netflix directly, or a 60-Day free trial through LiveUp. LiveUp is a members-only discounts club. While there’s an annual fee (S$28.80 first year, S$49.90 thereafter), members also have access to special promotions and free delivery at Redmart and foodpanda. Speaking of delivery, this is another great opportunity to check your credit card benefits–several offer rewards for dining (including online orders) plus promotions with merchants like Deliveroo and foodpanda. 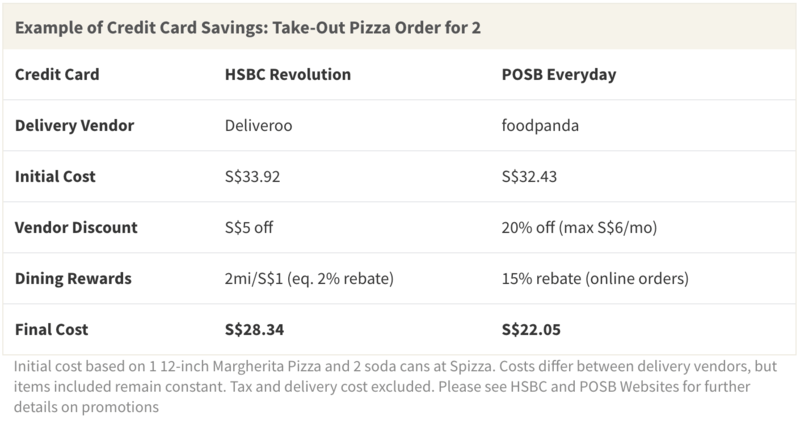 In fact, HSBC Revolution Cardholders receive up to S$5 off Deliveroo orders plus 2 miles per S$1 spend on local dining; POSB Everyday Cardholders can enjoy up to S$6 discount with foodpanda per month, plus up to 15% off online food delivery and catering. So order that takeout–even consider splurging! A good deal of what you pay can actually transform into rewards. If you’re feeling especially romantic, you can still earn when cooking a homemade meal for your date. Cards like OCBC 365 Card offer 3% rebate for online grocery purchases with merchants like HonestBee. On the complete opposite end of the spectrum, you may prefer an exciting night on the town for your date. In this case, cooperation can save a lot of money–ladies, it’s your turn to lead the way! This is essentially because heading to bars and clubs on ‘Ladies’ Nights’ could actually save you quite a bit of money. Lounges often waive cover charges and offer free drinks to women on select days. While this is meant to draw in all the single ladies, there’s no reason why men can’t come along too! While men will have to pay the cover and buy their own drinks, the cost of the date overall will be halved. Ladies’ nights are also often on weeknights, so consider this option if you don’t mind staying up late on a Tuesday or Wednesday. You can also, in the meantime, earn cashback on your night adventure. This is another date where cards like OCBC Frank and UOB YOLO truly shine, offering 5%–8% rebate on weekend spend at bars and clubs. Some credit cards also have nightlife promotions at venues like Tanjong Beach Club (UOB YOLO) and Zouk (DBS, American Express). However, these clubs are quite expensive so check into pricing before making promises to your date! Finally, if clubs aren’t really your scene, consider a night at Singapore Flyer. If you have a Visa credit card (Signature, Infinite, Classic and more) you can access a 50% discount off your second Singapore Sling ticket and enjoy the 30-minute flight over the stunning cityscape. Romance at a discount–is there anything better? For gentlemen–surprise her with flowers. Check out Visa’s 20% off discount at 1-800-Flowers and HSBC’s 15% off special at Far East Flora. Could there be a better way to make a first impression? Remember to finish your night responsibly. Book Grab, and make sure you and your date both get home safely. If you need an extra incentive, you’ll earn 8% cashback on each of your rides with Citi Cash Back Card, or up to 10% with UOB One Card. Good luck, and happy savings! The article How to Plan an Unforgettable Date Using Credit Card Perks originally appeared on ValueChampion.